Campwood Landfill can accept non-hazardous, high sulfate (sulphate) and inert industrial wastes. Waste is contained within fully engineered landfill cells comprising of a drainage layer, low permeability clay lining and a high density polyethylene membrane. 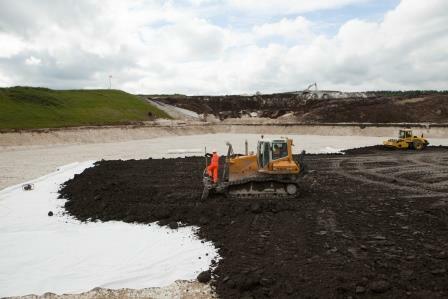 All surface water coming into contact with the landfill waste is collected and re used within the site. Campwood Landfill does not accept any organic materials, which allows us to accept non hazardous high sulfate (sulphate) industrial wastes without the need for a costly mono-cell. This presents a very competitive option for disposal of industrial waste. Industrial wastes containing sulfur (sulphur), sulfates (sulphates), sulfides (sulphides). Calcium based wastes from titanium dioxide production. Sludges and waste from on-site effluent treatment. Sludges, solid wastes and filter cakes from gas treatment. Waste concrete and concrete sludge. Gypsum based construction material waste. The site also has potential to accept gypsum based, sulfate (sulphate) rich and also other potential inorganic waste streams. We have also recently acquired the ability to process previously difficult to dispose sized tyres including large earth moving tyres to become part of the fully engineered landfill. Due to the stringent safety measures in place, we can accept articulated vehicles onto the landfill area. Campwood industrial waste landfill is situated within the main quarry and landfill waste is used to help restore the void space of the quarry so that it can be handed back to agriculture and forestry and become useful land for future generations. Singleton Birch is committed to the highest standards of health, safety and environmental protection. We aim to work in a flexible way with our customers to ensure that we meet their requirements in the most efficient way possible.